The Cloud has been designed for users who need a maximum of positioning possibilities and pressure relief. The seat area is divided into 14 cells which are anatomically arranged upon a foam base. This allows one to achieve a large contact surface providing efficient pressure relief. The side cells of Floam provide additional support. 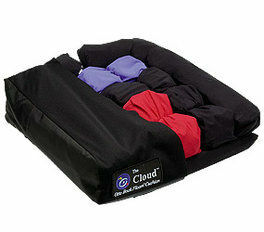 By simply exchanging the Floam cells, the Cloud cushion can be quickly customized to accommodate specific user needs. The Cloud cushion is delivered with a water-repellent cover.